Photo Blankets. Custom Blankets Personalized By You. 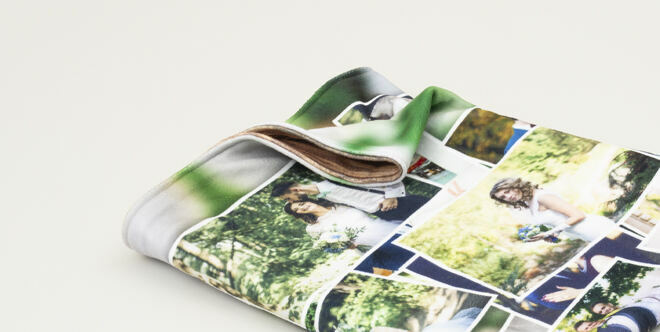 Design a customized photo blanket with your photos. All our 8.41oz printed personalized photo blankets are made using thick, soft, polar fleece for maximum comfort and exceptional color print. Design your own blanket with your face, photos or text. Highest quality print, thickest fleece, lovingly made. 100% satisfaction guarantee or you'll get your money back*. Soft custom printed fleece blanket, 16.82oz. 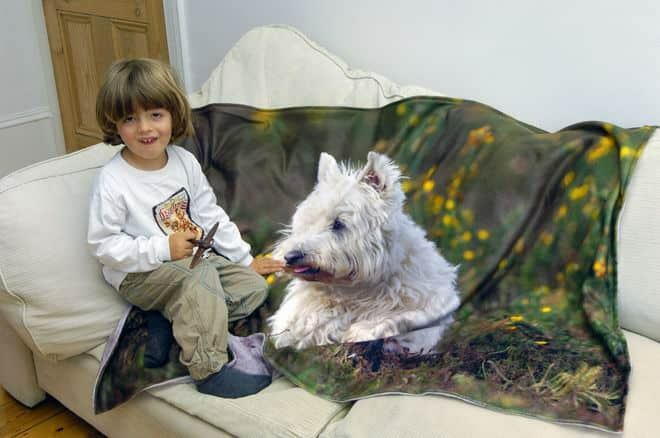 Our remarkable double thick personalized photo fleece blankets or fleece custom blankets with pictures are beautifully printed and stitched to order with your design. Customize blankets and make a versatile loving memory blanket with a choice of color backing. Best thing is, you get to create and make your own blanket online. Photo blanket exceeded expectations. Very Pleased. We're liking it. Your guidance on file size of pictures was helpful. Delivery was amazingly fast. The photos are very good on the fabric. We like it a lot. Sometimes you just have so many photos, it's hard to choose just one, so why not create a stunning collage design that features all your favorite snaps? Upload a selection of images and apply them all to the blanket in the design interface. Choose from a range of automated montage styles or rearrange and edit the pictures manually. 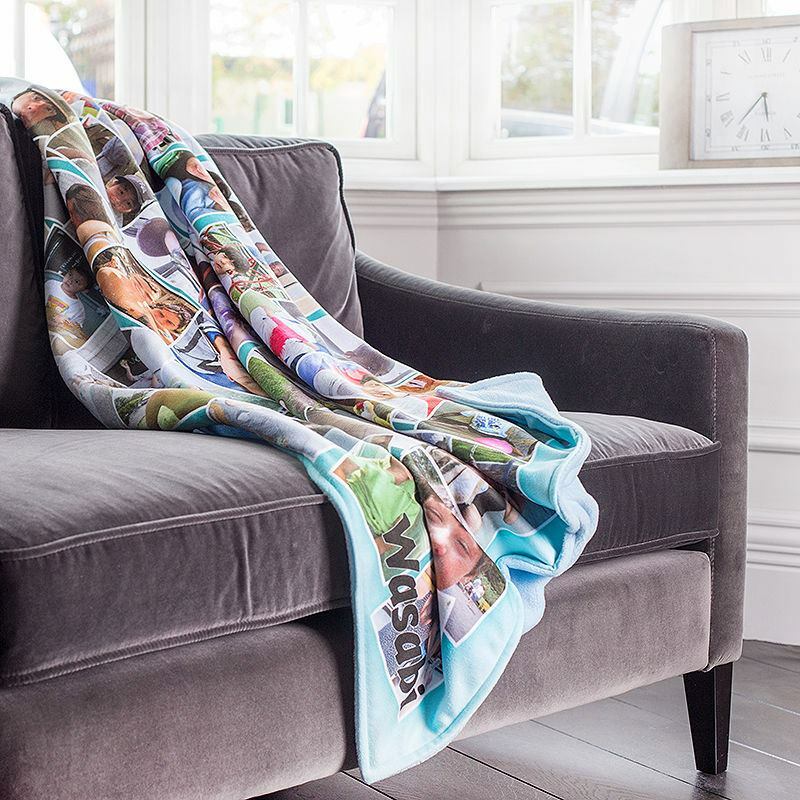 Whether it's photos of family and friends or moments captured from a special event that you want to commemorate, a collage blanket is a sensational gift that preserves your memory in a totally unique way. Our custom blankets with pictures on are available in 4 different sizes to suit any age. Whether you have a fun picture blanket in mind or want to design your very own, we've got a size for everyone. If you want more than one picture on your blanket, you can easily create a photo montage with our simple system as well. Use all your favorite photos to design a fun photo collage blanket that'll brighten up your living space with our personalized blanket with photos to match your decor. Use them around the home in all manner of ways. Bedrooms, living rooms, personalized photo throw blankets on sofas, personalized Christmas blanket, any way you like. Make your own blanket simply and easily with us. This photo on a blanket idea is the perfect memory gift for people with dementia or Alzheimer's. If you need a present that keeps pictures and memories front of mind for someone with Alzheimer's or dementia we can help. Print a collage of photos on our blankets and they can sit and cuddle up with photos of family to be constantly reminded of loved ones. Give someone living with Alzheimer's or dementia custom photo fleece blanket gifts they will appreciate and help keep the family memories stronger for longer. Personalized memorial blankets with photo are easy to make an delightful to give and receive. As your custom blanket maker, you can trust us to make custom made blankets with pictures in the highest quality. Our experience and attention to detail is second to none. We are the original and best custom fleece photo blankets maker having developed custom image blanket by chance in 2004. Today we are not the only place to customize a blanket with pictures, but we are the best for print, sewing quality and speed of production and service to your door. We won't disappoint, so design your custom picture blankets now, it's easy and fun to do. Our system is highly to easy to use and we have an app for personalized blankets to do all the hard work for you. Care: Custom printed fleece blankets are machine-washable at recommended 85 degrees F. Low tumble dry ok. No ironing needed. 10 years guarantee on print, material and stitching finish. Your unique photo, text or designs are printed onto the surface of the fleece, where the eco-inks are fused deep into the fibers, guaranteeing the colors and quality resist fading over time. If you've chosen a single-sided blanket, choose from either a soft pink, baby blue, black or cream backing. Two layers of 8.41oz polar fleece fabric are printed and hand stitched together by our expert seamstresses, resulting in a thick and sumptuous 16.82oz double thick fleece, probably the thickest available. Care: Your bespoke blanket is made from responsibly sourced anti-piling fleece, that has a gorgeous plush texture. It can be machine washed at 30°c or lower on a short spin. Leave to drip dry flat or tumble dry on a low heat. Do not wring out. Even with regular use and washing, your photo or designs won't peel away or scratch off thanks to the specialist printing process. That's why we offer a 10-year guarantee on the print life, quality of the material and stitching finish. Whether you're looking to add an extra special touch to your soft furnishings or need a housewarming present for friends, printing on this gorgeous fleece blanket gives you total freedom. Make the most of double-sided printing and get essentially two in one. Design each side in a completely different style so you can easily switch up the décor. Whether you use photos of their dog, family and friends, or even print your face, or whether you use a pattern to complement the interior design, the stunning high definition print will guarantee it's a centerpiece of any room. A cute idea is to turn your blanket into a fun, educational resource that your children can take with them everywhere. Print a numbers game, the alphabet, animals or different colors to help them learn on-the-go. Include their name too to make the little one feel special, and more encouraged to participate. Create a snuggly personalized blanket to celebrate a special occasion. A milestone birthday, Valentine's Day, or even Christmas. A fluffy personalized Christmas blanket is perfect for cuddling up on the sofa and watching those brilliant Christmas films through the festive season. Create your own original bathroom towels for home and family. Photo towels or designer towels. Customize towels as you wish.